Parallel Engineering was established by Simon Ratcliff in 2014. Although he has been riding, maintaining and improving his own Norton Commando for over 30 years, his passion for motorcycles began on a repair and maintenance course in his late teens. Along the way he has gained invaluable knowledge and experience as an automotive mechanic and through employment as a motorcycle courier in London. His qualifications, as a mature student from Coventry University, include an HND in automotive engineering and a degree in mechanical engineering. Research into the unsatisfactory steering and handling of his Norton suggested the general consensus blamed the Commando frame and isolastic rubber mounting system. However, being aware of TT success of production Commandos and the Norton Monocoque, both bikes featuring isolastic mounts, Simon concluded the problem was not frame design but frame alignment. Using his knowledge of engineering principles and motorcycle chassis design and theory Simon developed a method to determine and correct motorcycle rolling chassis alignment. Although a Norton specialist, he is happy to work on all makes of classic bikes and has customers throughout the UK. Why does a motorcycle which can be stable for example at 50mph, become unstable as speed increases? It is caused by misalignment of the rolling chassis and an increase in the rate and magnitude at which the motorcycle is hitting road bumps and undulations . You can't do much about road bumps but you can do something about your motorcycles rolling chassis alignment. 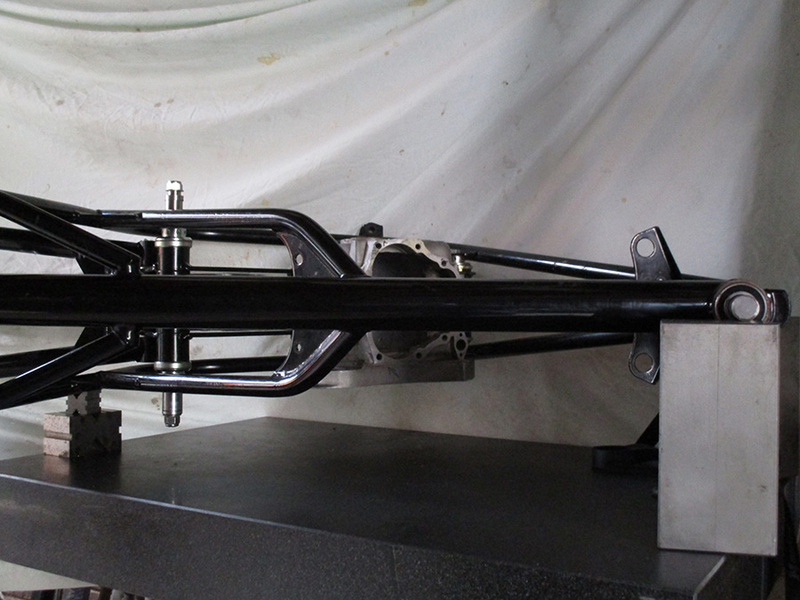 The closer a motorcycles rolling chassis is to true alignment then the more stable it will be at speed, which is why Parallel Engineering re-engineer frames and associated components to within ten thousandths of one inch (0.010") or a quarter of one millimetre (0.25mm) when carrying out precision alignment. In addition to improved stability, handling and steering, your motorcyle's performance gets a boost with an increase in MPH and MPG, because precision alignment means engine power is not wasted having to overcome tyre scrub from mis-aligned wheels.